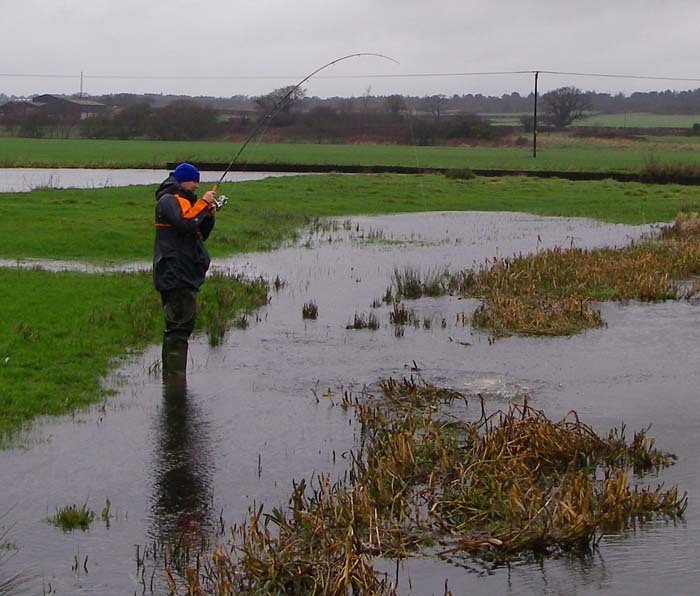 One of the classic comments of non-anglers is "Don't the fish bite better when it's raining?" 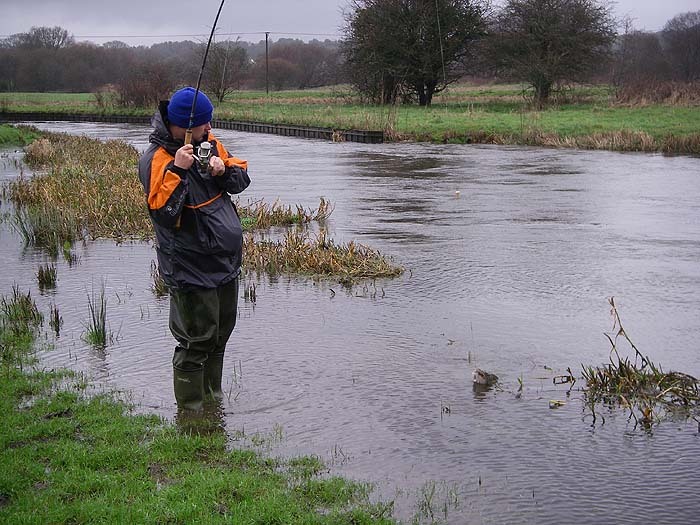 Despite this myth I have to say that I've never been keen on going fishing in the ******* rain. I don't mind too much if the rain starts after I do but I have always found it depressing to get out of the car and put on my gear in the middle of a downpour. The other day my pal Dave Baker rang up to say that he was down at Swanage for a couple of days with his family "- did I fancy a bit of fishing?" We arranged to go a couple of mornings later. When it came to the appointed hour it had rained for most of the night and was still raining. I thought about ringing Dave to call it off but decided against it because I hadn't seen him for some time (since last year's bass fishing). We met near the river and the rain was still bucketing down but the river had not yet risen (the next day it was like cocoa) and looked fishable. We managed to catch a few smallish baits and I gave Dave one of my traces (knottable wire and circle hook) and a split cork for a float. He was using the newish Fireline Crystal braid on his reel and I have to say that it looked white rather than transparent but it is just as impressively strong and tangle-free as the old Fireline and doesn't seem to 'peel' in the same manner. We tried half-a-dozen pools without a sniff and I was beginning to wonder whether the rising water level had put the pike off. However, we persisted and moved down to another pool. This time we were in luck. I told Dave to drop the bait into a tiny bay at the edge of the pool and almost at once the float shot away. He tightened to the fish as though he had been doing it all his life and he was in. The pike fought strongly and it was alittle while before it slid onto the grass of the flooded meadow - probably double figures. We were both chuffed and encouraged. 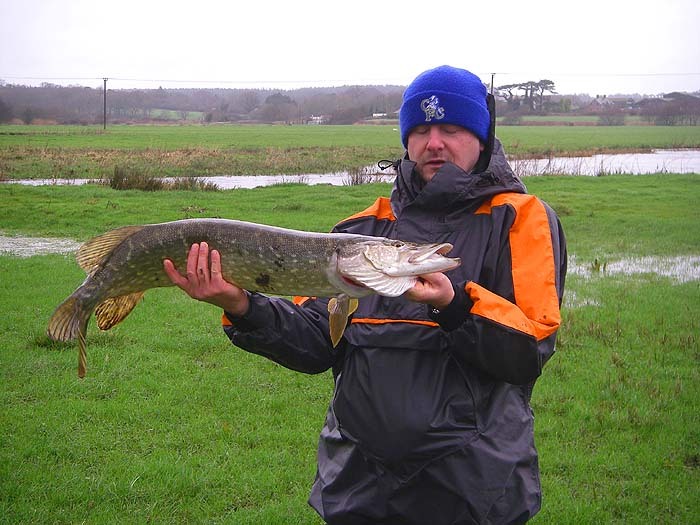 Shortly afterwards I had another pike - not as big as Daves - as he was quick to point out and then, just before we packed. in I had another. This one was a bit bigger but still smaller than the first one. More ribbing from my "friend". Next time Dave I'll catch the best fish. All the fish were lip-hooked on the circle hooks - more evidence of the effectiveness of these tactics.